You can get a cast iron teapot (inside is enameled and exterior is painted) at a Teavana store or online. I really enjoy my teapots. One of my favorites is an all white one that a family member got in Germany many, many years ago. Does anyone else have a collection of teapots? Do you use them or just display them? Not sure it qualifies as a collection, but I do have several. (Would anything more than two qualify as a "collection?") Might even consider making some pics, but not tonight! Not sure which is my most prized. Probably the one that nearly matches my Mom's Noritake Canton set. I got it last year for us to enjoy a tea party for my birthday. Then there is the Minton Haddon Hall Blue which was a completely accidental acquisition, and a terrific buy. I thoroughly enjoy a whimsical Johnson Bros. from their "Born to Shop" series. That is my every day teapot. Then again, the "Old Country Roses" teapot is pretty special to me. And a Windsor pot that was a surprise gift one summer day. That's most of them! I like this glass one you have with the tea light under it. What is it? I have a Frankoma one, a blue willow one that is old and a 1940s one with flowers on it that has a stand for it. I have never thought I had a "collection" of teapots either, I guess because they aren't all in one place or on display. My glass one is made by Teavana and the cast iron one is from Japan. I have blue willow dishes but not the teapot. I have one that is blue with a Currier and Ives quaint winter homestead scene. I have a white German-made one and an old Arthur Wood made in England. I use all of them except the Arthur Wood, it is pretty chipped up and cracked. I think they are beautiful and I love to see tea pots when I visit others' homes. Would love to see pictures of others' teapots. I love the one with the tea light under it, too! I have a silver teapot, a small decorative teapot, and a cheap serviceable teapot that I actually use, but I love teapots and would love to have a pretty one that was also serviceable! I'm envious of your Teavana one! 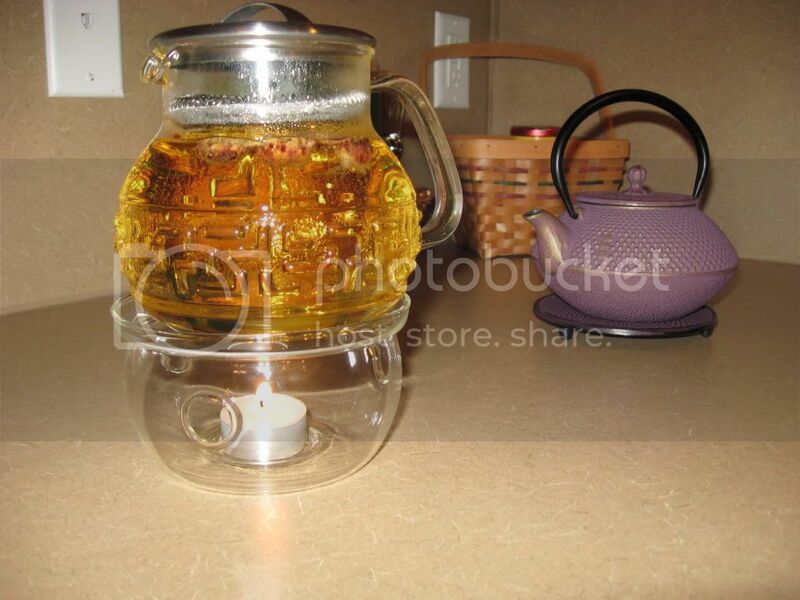 It is so fun to put Chrysanthemums in it and enjoy their beauty while drinking the tea. It is a fun teapot to use when a friend is over.